Net neutrality: what is it, and why is it important? On December 14, the five commissioners of the Federal Communications Commission (the FCC), the U.S. authority in charge of regulating the telecommunications industry, are scheduled to vote on removing the regulations that uphold net neutrality. Keeping these regulations in place is vital to the health of the Internet and small businesses in the United States. Net neutrality is the concept that all traffic on the Internet should be treated neutrally, or equally. That is, an Internet service provider (ISP) should not discriminate between traffic to and from particular websites. For example, an ISP cannot favor traffic to Bing more than that to Google. This has been the status quo on the Internet for the past 30 years. Net neutrality is not the Internet version of the FCC’s old Fairness Doctrine. The “neutrality” in the name “net neutrality” does not mean that content on the Internet must adhere to editorial standards of neutrality. Likewise, net neutrality regulations only apply to ISPs; there is nothing stopping a private business or family from enacting filters to censor content they do not want users of their computer systems to access. Why is net neutrality important to small businesses? Without net neutrality regulations, companies would, in effect, be able to bribe ISPs to favor their websites over that of their competitors. If a company didn’t pay up and their competitor did, the company that didn’t pay could be slowed down or even blocked by the ISP. The impact of a lack of net neutrality regulations is especially dramatic for small businesses. Denexa Games, for instance, is such a small business that the whole enterprise and all its assets can fit within an 11-foot cube. (Possibly smaller, depending on how close the President and Vice President are standing.) One of our competitors is owned by a large conglomerate which also owns zinc mines and makes mason jars and space heaters. Obviously, that conglomerate would have far more resources to spend on “marketing efforts” to cause ISPs to favor their traffic. For a small business like Denexa, who makes the vast majority of our sales through our ecommerce website, the need for net neutrality regulations is obvious. Without it, we wouldn’t be able to compete. If you agree with us that net neutrality regulations are worth keeping, it’s not too late to act. The proposed repeal of the regulations is currently within a public comment period. Contact the FCC by leaving a comment on Docket 17-108 in favor of net neutrality protections. You can also contact your legislators to voice your concerns. Below is the contact information for the Congressional representatives for our part of Oklahoma; if you live outside our area you can find information on how to contact your representative at the websites of the U.S. House and U.S. Senate. Totit is an extremely simple fishing game from the Indonesian island of Java. It can be played by two to six people. In Totit, it’s all about making pairs—while pairs of the same rank can be captured, only pairs of identical copies of the same card score! The object of Totit is to capture the most cards from the board by pairing them with the corresponding cards from your hand. Totit uses a special 60-card deck. To build such a deck, start with two standard 52-card decks of the same back design and color—we always use Denexa 100% Plastic Playing Cards, naturally. From each deck, remove the aces through 10s of clubs. From the other three suits, remove the 10s and face cards. You’ll be left with two 30-card decks consisting of A–9♠, A–9♦, A–9♥, and J-Q-K♣. Shuffle these two 30-card decks together to form the full 60-card deck. (Note that this is the same deck used for Kowah, another Javanese card game.) You should also have something handy to keep score with. Shuffle and deal eighteen cards face up to the table. Then, deal seven cards to each player, or eleven cards to each player in a two-player game. Set aside any unused cards; they will have no bearing on the game. The player to the dealer’s left goes first. If they have any cards identical in rank and suit to any of the cards on the table, they may capture the table card by revealing the matching card in their hand. They then place both cards in a face-down captured-cards pile in front of them. A capture must always consist of one card from the hand and one from the table. Players can never capture a card with another one from the table. Players may only make one capture per turn. If a player cannot make a capture, they must trail one card of their choice face up to the table. The turn then passes to the left. On the second and subsequent turns, a player may capture a card if they hold a card of the same rank as a card on the table, regardless of suit. All of the face cards and aces are considered to be equivalent to one another. The A♠ can be captured by the K♣ and vice versa, the J♣ and Q♣ can capture each other, and so on. One special restriction occurs when two cards of the same rank and suit appear alongside one or more cards of that rank, but a different suit. In this case, any cards of the odd suit must be captured first. Only when the two identical cards are the only cards of that rank left on the table can one be captured. The deal passes to the left, and game play continues. The game ends when every player has dealt once. Whichever player has the highest score at that point wins the game. Delphi is a simplified version of Eleusis for three to seven players. As in Eleusis, the central premise of the game is discovering a secret rule created by the dealer. Accomplishing this goal is done by looking over the line of previously-played cards and attempting to spot a pattern. The main difference between Delphi and Eleusis is that in Delphi, each card played to the table is one randomly drawn from the deck, rather than intentionally placed by the players. Players are rewarded for correctly declaring which cards correctly fit the pattern and which do not. Delphi is the creation of the American scientist and mathematician Martin David Kruskal. Dr. Kruskal published the game in 1962 while a professor of astronomy at Princeton University. Noted for his playfulness, Dr. Kruskal also devised the “Kruskal count”, a magic trick that could even stump other magicians because it was based on deep mathematical principals, rather than the usual sleight of hand. The object of Delphi depends on whether you’re the dealer or just a player. For the players, the object is to figure out the dealer’s secret rule as quickly as possible. For the dealer, the object is to create a secret rule that’s neither too hard nor too easy to figure out (ideally, about half the players should be able to guess it). 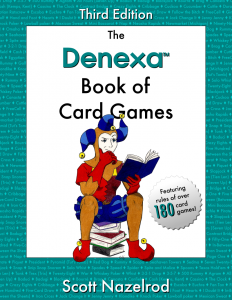 For a game of Delphi, you’ll need one standard 52-card deck of playing cards. 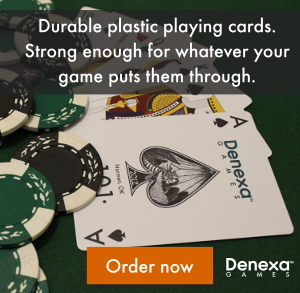 Of course, we very much recommend using a deck of Denexa 100% Plastic Playing Cards. You also need pencil and paper (or something similar like a smartphone app) to keep score with, as well as some form of marker or token (like poker chips, beans or other counters) to keep track of the number of correct guesses a player has made on that hand. You should have around 25 tokens for each player (other than the dealer) in the game. If desired, you may also give a decision marker to each player, something that clearly indicates a yes or no response, such as a coin (heads being yes and tails being no) or simply an index card marked “YES” and “NO” on opposite sides. Give each player one token, keeping the rest as the oracle’s bank. Shuffle the deck and turn one card, face up, to serve as a starter. The rest of the deck becomes the stock. The oracle turns one card face up from the stock, placing the card where it can be easily seen by all of the players and announcing its rank and suit. The players then decide whether this is a “correct” play according to the dealer’s secret rule. Obviously, on the first turn of play, this is likely little more than a 50/50 guess, but as the game goes on players will become more confident in their knowledge of the rule and thus be able to decide more accurately. Once players have reached a decision, they set their decision counter, if playing with one, to reflect this, keeping it concealed with their hand from the other players. If not playing with a decision counter, each player just takes a token or other small object in their hand, shuffles it from hand to hand under the table, and places their closed fist above the table. If they have something concealed in their hand, it indicates a “yes”, and if their hand is empty, it indicates a “no”. The next card is then drawn, and the process repeats until all 52 cards have been placed on the table. After the hand ends, each player counts the number of tokens they have. Their hand score is the difference between their own token count and that of each player who collected fewer tokens, added together, minus the total count the difference between their count and that of each player who collected more tokens. For example, consider a game where Player A collected 29 tokens, B collected 26, C collected 19, D collected 11, E collected 9, and F collected 6. Player C’s hand score would be the difference between their count of 19 and that of D, E, and F, minus the difference between their count and that of A and B. Thus, their score would be (8 + 10 + 13) – (10 + 7) = 31 – 17 = 14. Note that it is possible to get a negative hand score, as F’s score would be 0 – (23 + 20 + 13 + 5 + 3) = –64. The oracle’s score for the hand is the total of each player’s difference between their count and that of each player who collected more tokens. (That is, everything that is subtracted when each player calculates their score.) In the example above, Player A’s total difference is 0, B’s is 3, C’s is 17, D’s is 25, E’s is 27, and D’s is 64, so the oracle would score 136 points. All of the tokens are then returned to the bank, and the next player to the oracle’s left becomes the new oracle. Game play continues until each player has been the oracle once.